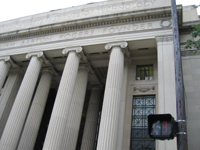 MIT on the Road, a special event hosted by the Institute, is coming to Philadelphia! Don't miss this unique opportunity to spend a day with three of MIT's incredible faculty, exploring our rapidly growing understanding of the life sciences resulting from the convergence of the engineering mind with scientific discipline. Join us as we examine such major issues as treatment for Alzheimers's Disease, the roots of cancer-causing mutations, and stunning advances in the human body and machine interface. We will also enjoy the elegant ambience of the newly renovated Bellevue Hotel. We are grateful to Lou Alexander of the MIT Alumni Assoc. for arranging this grand event. Details and links to more information are given below. REGISTER for MIT on the Road. MIT on the Road Web Page at the MIT Alumni Assoc.